We stock both new and re-manufactured Glycol Gas Dehydration units, which come with a one-year warranty. Options for dehydrators include flash gas separator, various pump configurations and 8-10 tray configurations. Towers and re-boilers are in stock and can be configured to specific project requirements. 16" Standard Remanufactured Glycol Gas Dehydrator c.w. c/w Eclipse main burner & pilot. 8 5/8” diameter x 90” high c/w 2” vent connection. 3/4” x 11.5” 316 SS T.W. working pressure as per ASME Section VIII. working pressure as per ASME B31.3. 16 dia. x 32' approx. 16" diameter x 72" long. 1" Lean / Rich Glycol coil. Removable design. 1" Fuel Gas preheat coil. Removable design. 220 Volt 3 Phase. 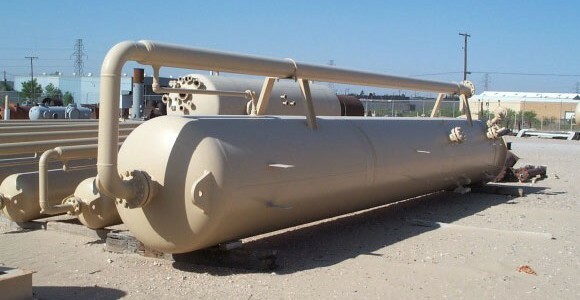 Explosion Proof Housing. 6 5/8" diameter x 54" high c/w 2" vent connection. AGA 3C Configuration. 2000 edition. (2) Shelco Model 806 Filter Canister. Will be hydrotested to 1.5 times the maximum allowable working pressure as per ASME Sect. VIII. Will be hydrotested to 1.5 times the maximum allowable working pressure as per ASME B31.3. 304 SS Spiral wound Flex. After Receipt of Approved Construction Drawings. a. Contactor tower as quoted has 8 weld-in trays installed. Reman. 20" glycol dehy, 600 ANSI, sweet, split 8 tray tower c.w. 175kBTU/hr reboiler, skidded, housed. This unit is completely remanufactured and built for OilPro. Unit is ready to ship in 8 weeks a.r.a.d., and features a break flange, which makes for easy shipping and setup. All QC and instrument & controls documentation on hand for review. 8” diameter x 60” high c/w 2” vent connection. ¾” x 11.5” 316 SS T.W. Package is shipped EXW Aspire Energy Resources Main shop in Red Deer, AB. Contactor tower has "NEW" weld-in trays installed. All glycol piping shall be socket welded. Dehy, 20" x 28', sweet service, 1440 psi MOP, 8 tray, split tower design, 3 phase, dressed 2 phase, remanufactured to like- new standard, multi provincial registration. 8” diameter x 72” high c/w 2” vent connection. This package is offered complete with warranty on all components. Unit can be delivered in approximately 6 weeks after receipt of Approved Drawings. 24” O.D. x 32’0” S/S x 1415 psi MAWP Glycol Dehydration unit. 12” diameter x 96” high c/w 2” vent connection. (2) Shelco Model 806 Filter Canisters. Will be hydrotested to 1.5 times the maximum allowable working pressure as per ASME Section VIII. - All Glycol piping is socket welded. - 15 year history as a dehydration manufacturer/rebuilder and specialist. Aluminum flame arrestor c/w Eclipse main burner & pilot. 12” diameter x 96” high c/w 3” 150# RFF vent connection. throttle acting dump valve cw. This is a completely new package. Modern split-flanged, 10 tray tower design for improved performance and reduced setup & transportation logistics. Delivery is between 6 and 10 weeks (typically 8) depending on stage of completion of stock package at time of order. Note that options chosen, typically do not increase delivery, as we already stock various pumps, Flash tanks and stripper columns already. However piping or layout changes may affect delivery, depending on the nature of the changes. 8" x 4' Desiccant dehydration systems for fuel gas systems with wet gas. Desiccant SP/GasDry Peak is available separately $3.55/lb and comes in 45 lb pails. We can help calculate your requirements.